Postconsumer plastic waste bales arrive to the plant. 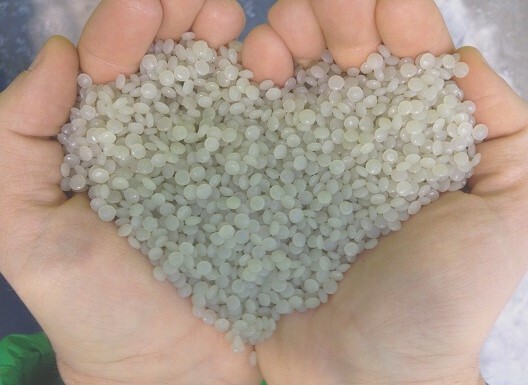 Saica Postconsumer rLDPE pellets. Heart shape. Raw material for the plastic converters industry. Postconsumer rLPDE pellets coming out of the extrusion line. Plastic waste sorted, shredded and washed ready to be regranulated. Plastic film reel produced with Saica postconsumer rLDPE. Bales are opened and plastic is sorted before washing. 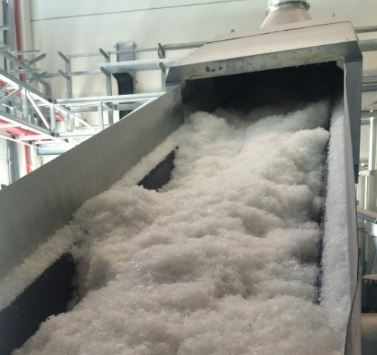 Saica company collects plastic waste of retail companies and recycles it into plastic pellets. 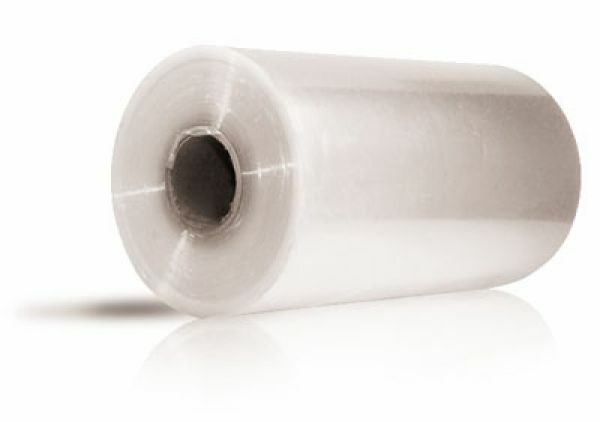 Saica delivers the re-granulate plastic to the film, packaging, bags suppliers of the original retailer. This way the circle is closed and the retailer gets its plastic waste back transformed into packaging. On average, more than 80% of the plastic waste is recovered as plastic pellets. The rest is transformed into energy. No plastic goes to landfill. In the new films, packaging and bags petrochemical virgin materials are replaced in a range from 15% to 90%. Carbon footprint is reduced on average by more than 60%. Saica’s recycling facilities are zero waste sites. Good quality recycling should gain a place by itself. Developing the right and profitable technology is the recyclers task. Regulation and product norms that ban the use of recycled materials could damage the business case. Unless it has been proven to be harmful. Regulation and taxes currently do not adequately reward product recyclability and recycled % content in it. Projects that aim to increase the quality, performance and % of recycled materials that can be used currently do not adequately have preference financial access and benefits.